Instead of doing the usual string bean pasta salad thing, try this recipe to add something new and exciting to your weekly meal rotation. The different flavors of beans really compliment one another, making the whole taste greater than the sum of its parts. :) Plus, you'll be adding a lot more fiber and nutrition to your meals as well, while at the same time skipping more caloric choices like pasta and mayo. Now it's true that this recipe does contain some avocado, which is high in calories and fat. However, the amount used in this recipe is moderate, and per serving, falls well within daily recommended guidelines (i.e., 1/4 to 1/2 of an Avocado per day). As I'm sure you've already heard a zillion times before, avocado is one of the highly touted superfoods. It contains healthy oils (i.e., monounsaturated fats), and in moderation, can be a highly beneficial addition to one's daily diet. Eating avocados can lower blood pressure and contribute to overall brain health. 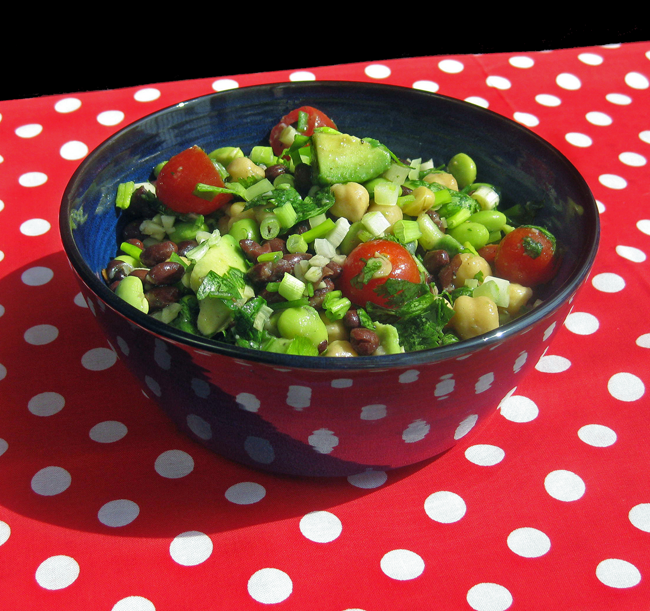 The beans in this salad -- edamame, chickpeas, and black beans -- are not only packed full of fiber, but they also have long-lasting protein and carbs, which will keep you going throughout your busy day. This dish is also an excellent source of fuel for athletes, as the mix of slow-burning carbs and blood sugar sustaining protein will produce a steady and prolonged stream of energy. Anyhow, enough health and nutrition info. Let's get onto the recipe itself. This dish is super-easy to make. The only thing you'll be cooking is the edamame, which only need to be boiled for a few minutes. Everything else is raw food, and requires minimal kitchen prep (i.e., just a bit of chopping). Your meal can be on the table for your hungry diners in under a half-hour. How great is that?! Several friends had requested that I create/post more salad recipes here, especially family-friendly recipes which could also be packed for on-the-go meals, so here you go. :) This salad can also be served as a side dish and would make a quick-but-tasty dish to bring to parties and picnics as well. Enjoy! Directions: On high heat, bring a large, covered sauce pot of lightly salted water to a rolling boil (about 8 minutes), and then uncover and add edamame. Cook until al dente. If using fresh edamame, boil for about 5-6 minutes. For frozen, boil for 4-5 minutes. When cooked properly, beans should be firm, not mushy. (If they're mushy, they've been overcooked, which will make them taste dry and blechy.) Better to air on the side of caution: Remove a sample bean from the pot using a slotted spoon after it's been cooked for the minimum required amount of time, run under cold water to cool, and then taste-test to check for doneness. When beans are ready, immediately remove pot from stove and drain into a colander. ** Rinse with cold water and let cool for an additional 5 minutes or so. Shell and place beans into a bowl. Discard (or compost) pods. Next, add black beans, grape tomatoes, scallions, garlic, lemon juice, and extra virgin olive oil. Then season with kosher salt, black pepper, crushed red chili pepper flakes, and cilantro, and toss. Add the avocado last, about an hour before serving, and gently toss, making sure to coat it with the lemon juice mixture to avoid oxidation. Marinate in a covered glass or ceramic dish in the refrigerator for at least a 1/2 hour before serving, to allow the flavors to meld. Serve chilled (or at room temperature) and enjoy! Yield: 6-8 servings as a main course, 8-10+ as a side-dish. Chef's Notes: This dish tastes even better if you marinate it overnight. Just make sure that if you're going to do this that you thoroughly coat the avocado with the lemon juice mixture to preserve its fresh, vibrant color and prevent oxidation. **Edamame can very easily become overcooked and mushy if you're not paying close attention to the precise amount of time it's been sitting in boiling, or even just hot, water. The beans will continue to cook even when you remove the pot from its direct heat source, so this is why they should be immediately drained and rinsed with cold water. Optional Additions: Corn kernels, artichoke, or gourmet brined olives like Kalamata or Greek olives (in which case you could just nix the salt in the above recipe altogether).